Do the dirty dishes pile up at your house? A stack of dirty dishes in the sink or on the counter instantly ruins my mood, how about you? 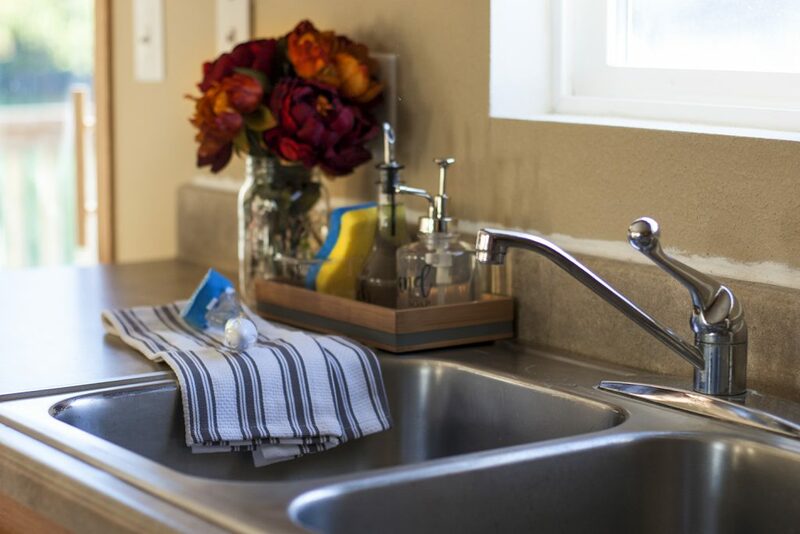 Today’s project will help you make your sink pretty and organized while keeping dishwashing necessities within reach to make cleanup fast. Selling our house this summer was a good motivator for me to establish better dishwashing habits. With all of the showings and walkthroughs that go along with selling a house, one room that needed constant cleaning attention was our kitchen. I got into the habit of doing the dishes after every meal (something we used to be horrible at). And I also found that having the right dishwashing tools at the ready makes all the difference. Now that we’ve moved and are settling into our new home, I’m determined to keep my good dishwashing habits. We used to let dirty dishes, pots and pans stack up for days before spending a solid hour scrubbing them clean. I’m now convinced that it’s much better to take a couple minutes to wash the dishes right away. I’ve found that I am much more likely to cook dinner when the counters and dishes are already clean. Plus, it’s such a good feeling to come home to a clean kitchen! I decided to set myself up for dishwashing success in our new house by creating a pretty tray of dishwashing supplies. 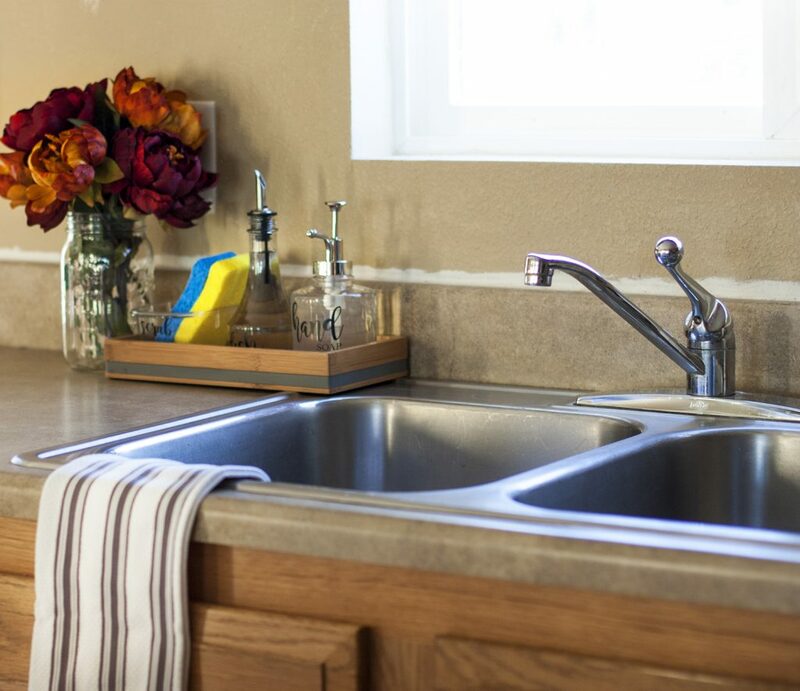 Here’s how to make your own and achieve an organized kitchen sink in an afternoon! 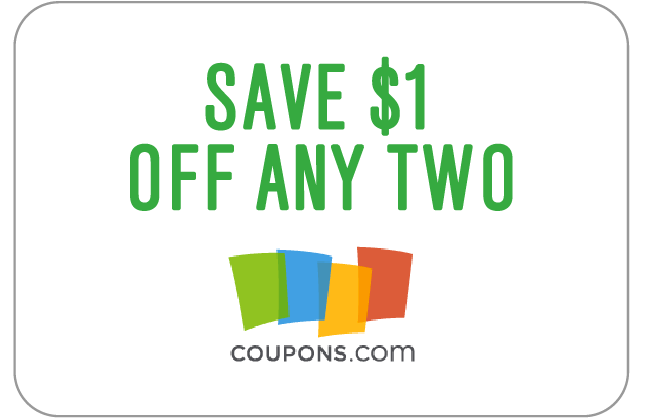 Snag this coupon for $1.00 off any two Scrub Dots items through December 31, 2017. 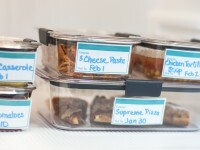 Next, label your jars. I used my Silhouette cutting machine to cut cute labels out of black vinyl. 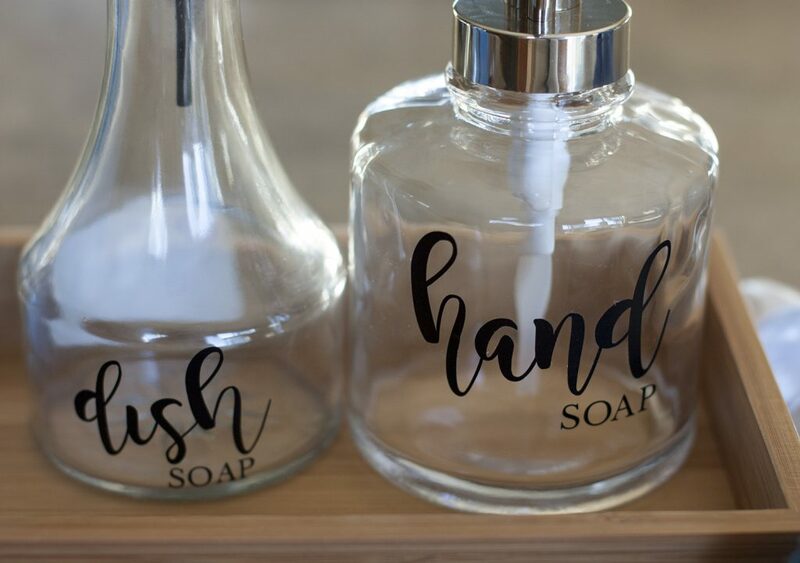 I labeled my containers “Dish Soap”, “Hand Soap” and “Scrub”. Aren’t they cute? 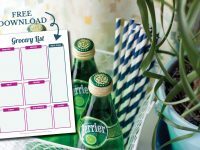 If you don’t have a cutting machine, you could use a label maker or print sticker labels with your home printer. 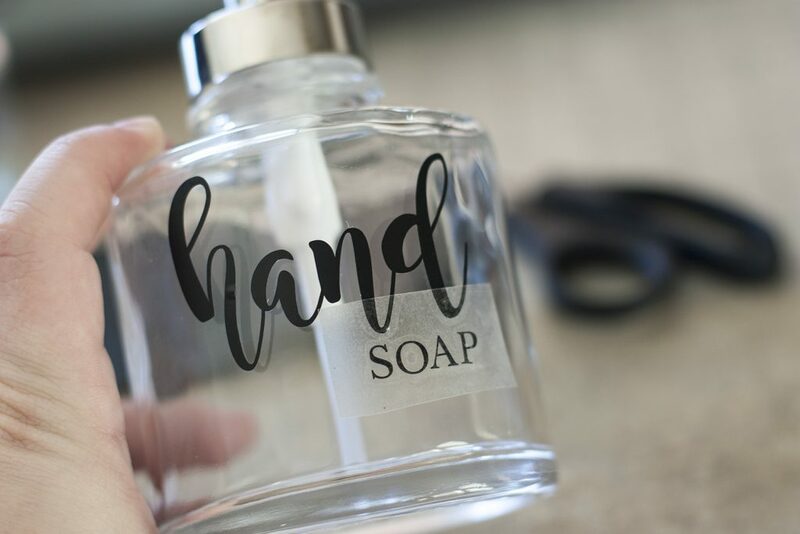 Once your jars are labeled, it’s time to add the soap! 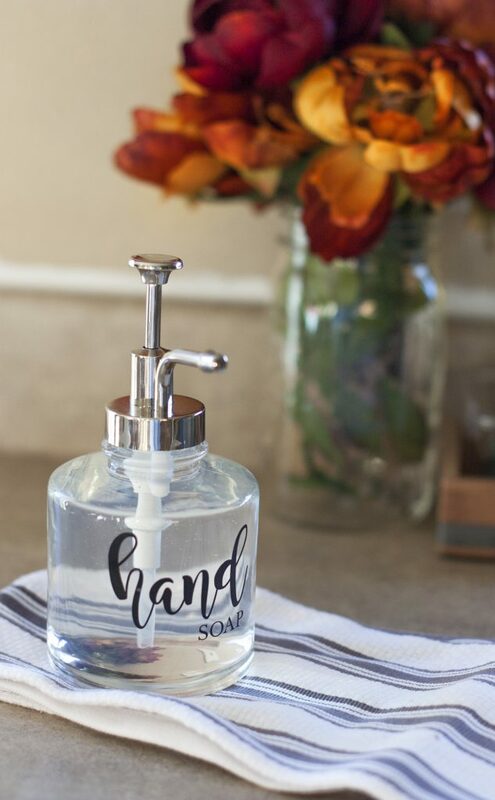 Pour liquid soaps into the hand soap jar, dish soap jar and the dishwand. I used the same color dish soap and hand soap so they would coordinate as a matching set. 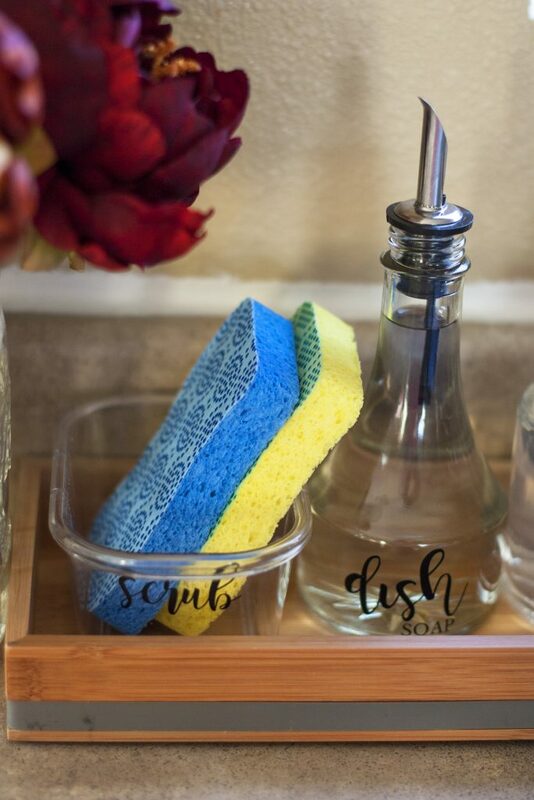 Now arrange your soap jars on the tray and tuck the sponges inside their little container. Putting it all on a tray makes things look neat and organized while keeping everything within reach. 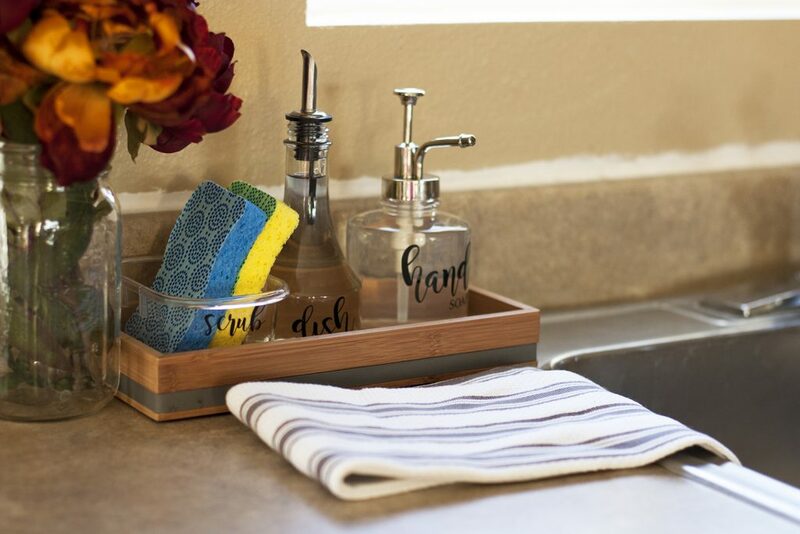 Place your pretty tray next to your kitchen sink and you’ll be ready to keep up with the dirty dishes! 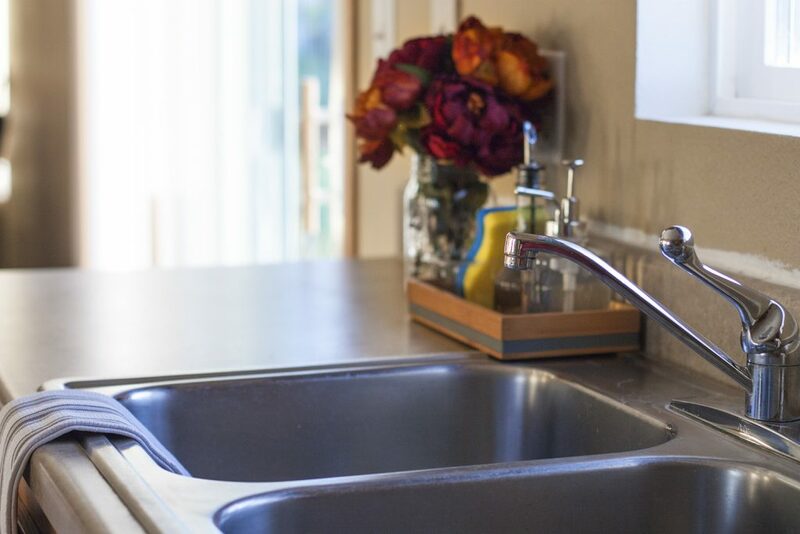 An organized kitchen sink is an instant way to brighten your day. 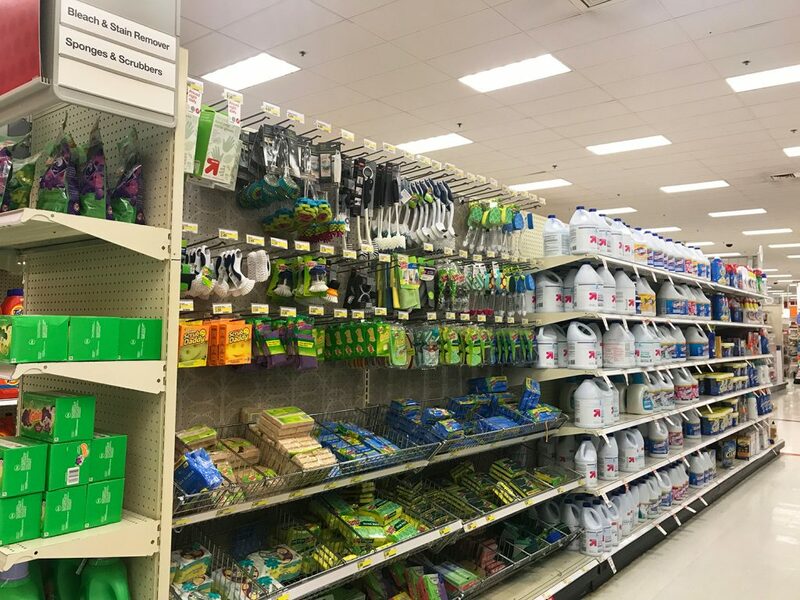 Now that you have an organized kitchen sink and all of your dishwashing supplies are within easy reach, you have no excuse for not keeping up with the dirty dishes! Equipping yourself with the right dishwashing tools really does make all the difference. 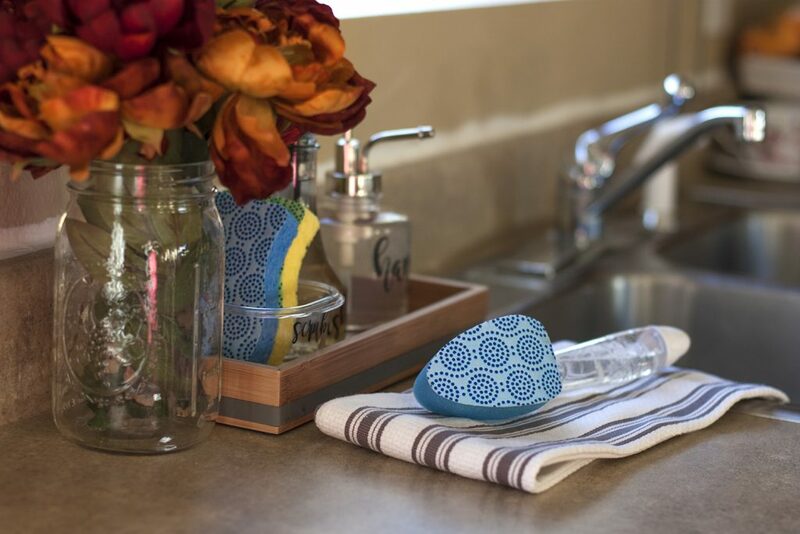 The green and yellow Scotch-Brite® Heavy Duty Scrub Dots Sponge eliminates baked-on messes (awesome for pots and pans! ), while the blue Scotch-Brite® Non-Scratch Scrub Dots will safely clean all cookware without scratching. Both feature the new innovative scrub dots that cut through messes and rinse clean. I also love the handy Scotch-Brite® Non-Scratch Scrub Dots Dishwand. Since it’s already filled with soap, it’s super quick to grab whenever I have a few dishes to wash. Plus, the handle means I don’t have to stick my hands in dirty dishwater! I like to use it to wash dishes I’ve dirtied during dinner prep while I wait for our meal to cook. 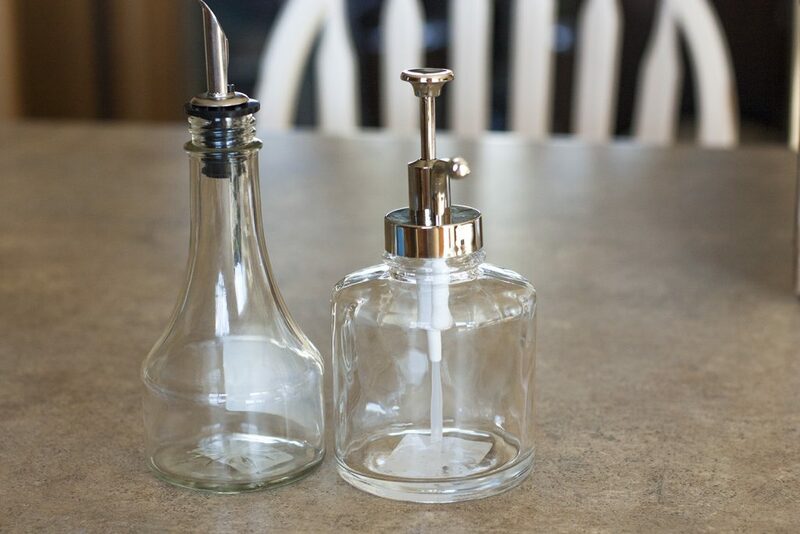 I hope this project inspires you to create your own DIY soap dispensers and achieve an organized kitchen sink. 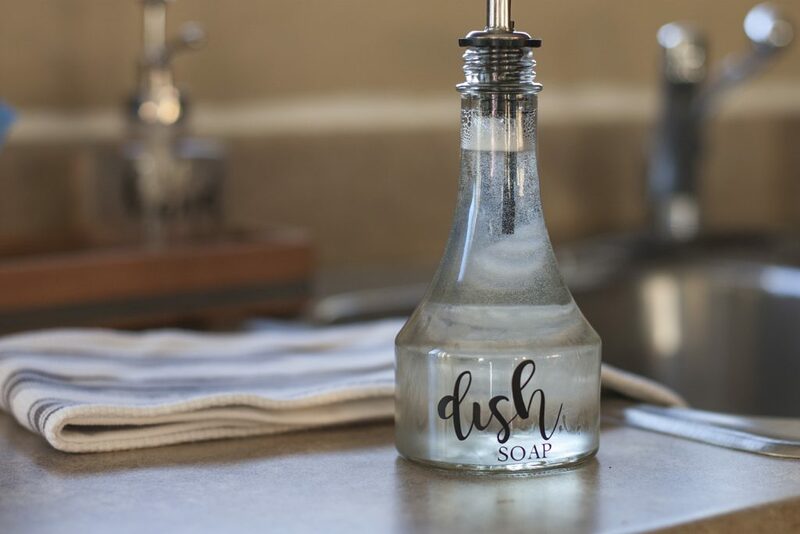 Doing the dishes isn’t exactly fun, but you can at least make it easy by keeping your supplies looking pretty and within easy reach! 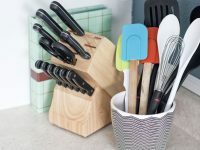 Click here for more kitchen tutorials and delicious recipes from other bloggers who are sharing #ScrubDot inspiration. 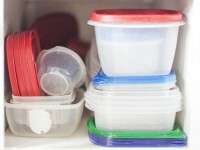 Are you someone who does the dishes as you go or are you guilty of letting them pile up? Let me know in the comments! I like the way your organized supplies for washing dishes. I do allow dishes to pile up in the sink sometimes. I hate to unload the dish washer. I think I should go back to washing my dishes instead of using the dish washer. Do you use your dish washer sometimes? Hi Pat, I hope this inspires you! I do use our dishwasher as well – mainly for dinner plates, cereal bowls and silverware. I find those things are easy to unload and put away. All the odd pans and things get washed by hand as we use them. If you don’t like the dishwasher, there’s nothing that says you have to use it! Find a method that works for you. Thanks for visiting! 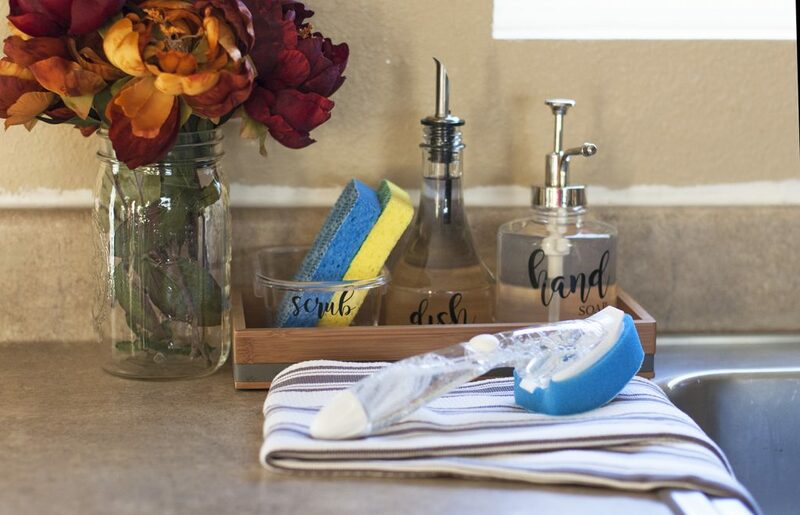 It’s definitely nice to make cleaning as easy as possible! Thanks for reading.